I bought a set of cedar grilling planks at the end of the summer clearance last year at my grocery local store – Wegmans. They have been sitting in my garage since last year – and I finally decided that it was time to try them out! And I am so glad I did – I wasn’t quite sure what to expect flavor-wise. But there really was a woodsy flavor imparted into the salmon, and along with the black pepper/brown sugar coating – these were delicious. Cooking fish can really be tricky – you want it done just to the right temperature – if its overdone, its really chewy and not too appetizing, and if its underdone – you are eating raw fish. So I always use my themapen when cooking fish (and really – I use it all time with tons of dishes) but it is really important to get the right temperature. And using the cedar plank cooked the fish slow enough that I was able to get these cooked absolutely perfectly. YUM! 1. Preheat grill on High. Combine brown sugar and cracked pepper together in small bowl; mix well. 2. 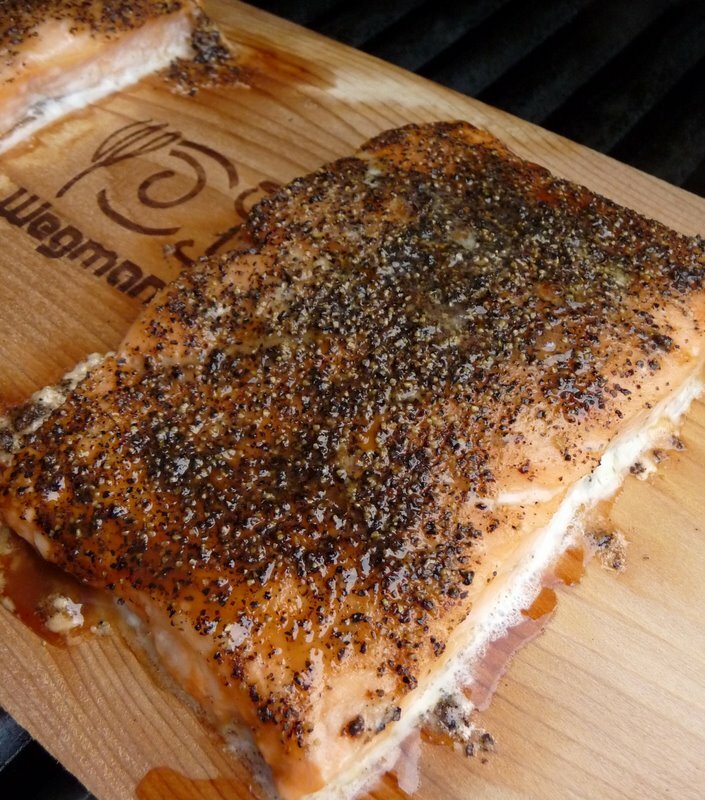 Arrange salmon on plank; rub brown sugar mixture evenly over fillets. 3. Place plank with salmon on grill; close cover. Reduce heat to medium; cook salmon 12-15 min, until internal temp reaches 130 degrees. Remove from grill; let rest at least 2 min. very nicely done! 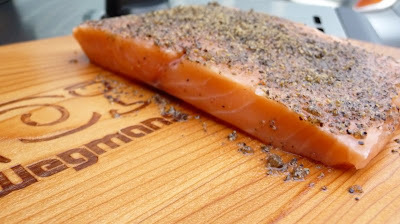 the cedar must have imparted such a nice flavor to the salmon! Don't you just love wegmans!